By Lynda Cheldelin Fell, Mary Lee Robinson, Maryann Mueller In Books Tagged In Lynda Cheldelin Fell, Mary Lee Robinson, Maryann Mueller, widow, and widowhood. Widows in today’s world find little support to recover and adapt to a life they didn’t plan. Friends, family, and others have little idea about how to help, leaving them in a vulnerable spot when they need support most. What can widows do? Where do they turn for help? How do they face the future and rebuild their lives? 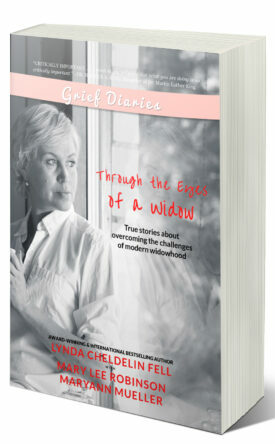 Through the Eyes of a Widow is a collection of stories by widows across the globe. Each shares her own personal insight into the hidden and often unspoken challenges of losing a husband, including the emotional, mental and social shifts she’s forced to reckon with in the aftermath. With poignant narration, each shares the truths of her loss, and the hope she finds along the way. Committed to publishing nonfiction stories that explore, education and inspire, AlyBlue Media is home to over 700 writers in 11 countries. Whether you write for us or publish your own, your story is yours to tell. Every sentence, paragraph, and page from cover to cover. Join us and get started today.